After a strong Q1, risk appetite extended into the first week of Q2. The most notable improvements were seen in the bond markets, as German 10-year yield turned positive again. US 10-year yield also reclaimed 2.5 handle. However, stocks and 10-year yield are both near to key resistance zone. Reversals could be around the corner. Besides, the positive development was not too much reflected in the currency markets, which is a sign of indecisiveness. Australian Dollar was the strongest one, partly on risk appetite, partly on Chinese data and trade talks, and partly on its own retail sales data, and a neutral RBA statement. 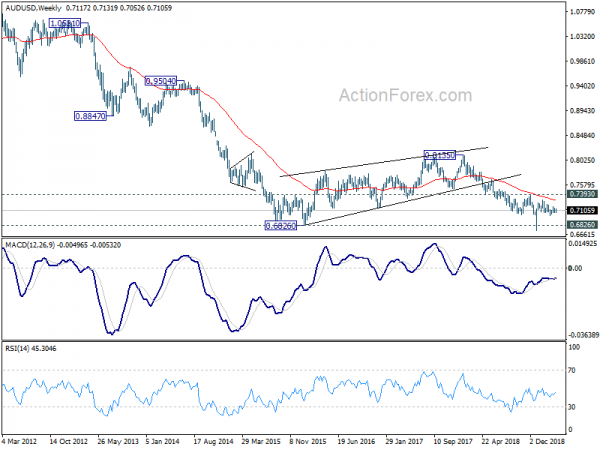 However, firstly, AUD/USD is kept in recent range between 0.7052/7168. 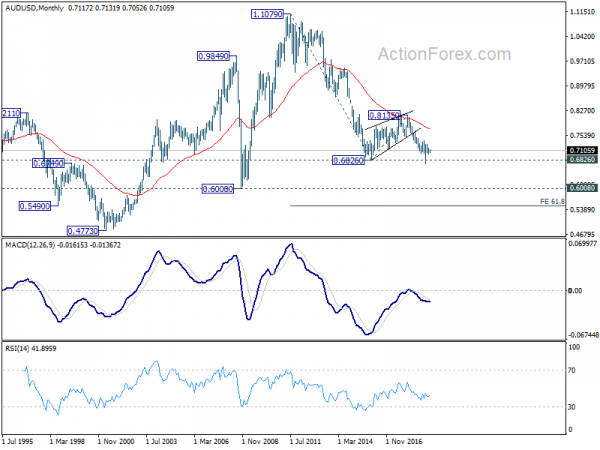 EUR/AUD failed to sustain below 1.5721 key support. 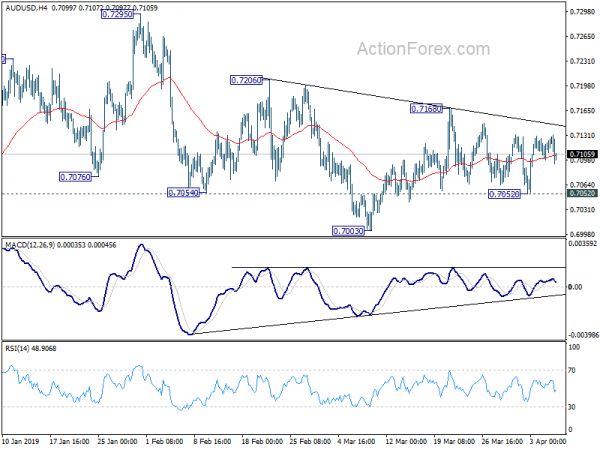 AUD/JPY also lost momentum ahead of 79.84 key resistance. It’s strength is not too convincing. Pound is the second strongest but was limited generally inside prior week’s range. It’s a strong signal that there was no clear direction. Meanwhile, Yen gyrated lower, together with Swiss Franc but there was no confirmation of bearish version. Also, neither of them was the weakest, but New Zealand Dollar. Fundamentally, signs were positive even though uncertainties remained. Both official and Caixin China PMI manufacturing rose back above above 50 in March, suggesting the government’s measures are starting to take effect. However, the rebound could also be due to post Lunar New Year seasonal effect. At least one more month of data are needed to confirm bottoming. In addition to China slowdown, Eurozone recession is another major economic risk. We’d probably need to wait for PMIs in the week of April 22 before clearing the clouds. UK data were distorted by Brexit preparations and could be ignored for a while first, like the markets did. Risks of no-deal Brexit remained as April 12 cliff-edge approaches, which would have an impact of both EU and UK. Economic data from the US were mixed only. Friday’s non-farm payrolls, with 196k growth in March, proved that February’s terrible figure was just a blip. ISM manufacturing also improved. However, slight softness was seen in ISM non-manufacturing. February retail sales and durable goods orders were clear disappointments. US-China trade talks were described as making progress. But no-one really knows how close they were to a deal. Trump was very precise and accurate on the situation with his vague languages. He said there would be a deal “within the next four weeks or maybe less, maybe more”. Overall, after the week, markets pared back some bets on a Fed rate cut the the end of the year. Fund fund futures are only pricing in 52.5% change of easing by December 11 meeting. That’s notably lower than prior week’s 65%. Though, a month ago, there was only around 6% chance of a cut. 10 year yield rose to as high as 2.544 last week before closing at 2.501, up from prior week’s 2.414. Friday’s single day reversal is worth a note. If could be an early sign of topping, just ahead of 2.554 support turned resistance. 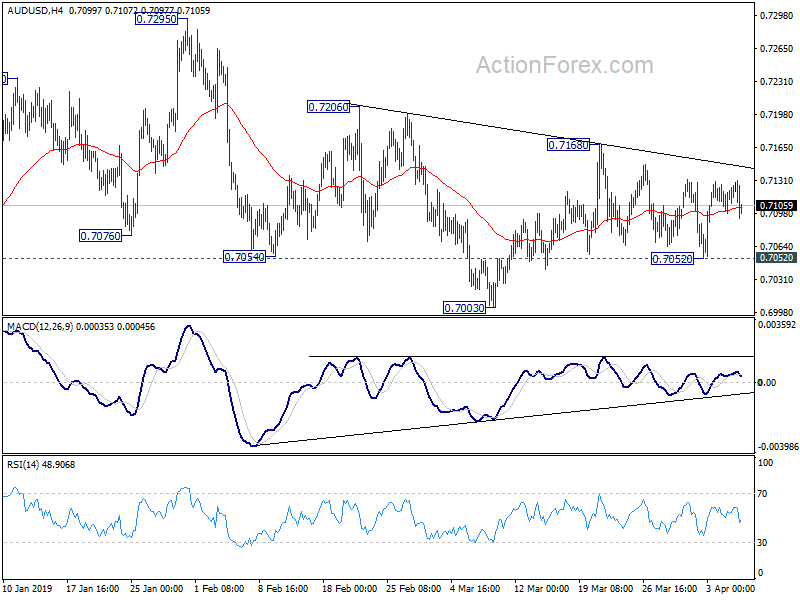 With 2.554 intact, rebound from 2.356 is seen as a corrective move. And larger fall from 3.248 is expected to resume sooner or later. DOW gapped up last week and surged to close at 26424.99, resuming rise from 21712.53. But Friday’s post NFP reaction was rather indecisive. Overall, we maintain that rise from 21712.53 is just seen as a leg of the medium to long term consolidation from 26951.81. While further rise cannot be ruled out, decisive break of 26951.81 is not expected. Break of last week’s low at 26071.69 will be the first sign of topping. Break of 25425.27 support should indicate near term reversal. Once again, Dollar index lost momentum ahead of 97.71/87 key resistance zone. There is no sign of up trend resumption yet. DXY could continue to gyrate around the nearly flat 55 day EMA. Though, in case of another fall, we’re not expecting a break 93.81 support. An eventual upside breakout is still expected. 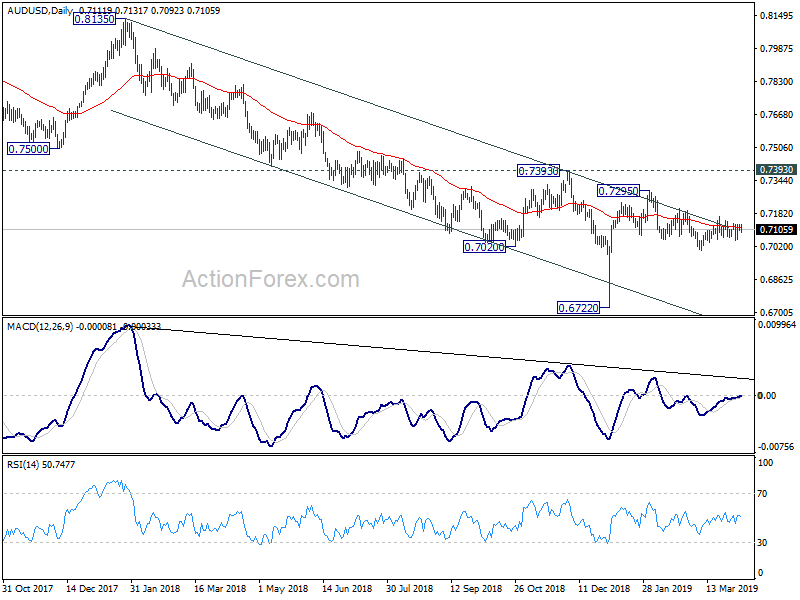 Despite some volatility, AUD/USD was bounded in range below 0.7168 last week and near term outlook remains unchanged. Initial bias remains neutral this week first. On the upside, firm break of 0.7168 resistance will suggest that the corrective decline from 0.7295 has completed at 0.7003 already. Intraday bias will be turned to the upside to resume the rebound from 0.6722 through 0.7295. On the downside, though, sustained break of 0.7052 will target 0.7004 first. Break will resume the fall from 0.7295 instead. In the bigger picture, as long as 0.7393 resistance holds, fall from 0.8135 is still expected to extend. Such decline is seen as resuming long term down trend from 1.1079 (2011 high). Decisive break of 0.6826 (2016 low) will confirm this bearish view and resume the down trend to 0.6008 (2008 low). However, firm break of 0.7393 will argue that fall from 0.8135 has completed. And corrective pattern from 0.6826 has started the third leg, targeting 0.8135 again. In the longer term picture, prior rejection by 55 month EMA maintained long term bearishness in AUD/USD. That is, down trend from 1.1079 (2011 high) is still in progress. Sustained break of 0.6826 will target 0.6008 low and then 61.8% projection of 1.1079 to 0.6826 from 0.8135 at 0.5507.